Written by: Stacy McCullough You like Invicta watches, but their men’s line is just way too bulky. You need a watch to fit the average dude – one that will look good and you can dive into deep waters with. Welcome to the 0524 Invicta Men’s Midsize Reserve Chronograph. The Midsize Chronograph is a handmade, special reserve watch meaning that there are not too many out there. The quality is easily seen through the beautiful stainless steel watch and barred inserts set into the band. The actual band is made of black polyurethane and is standard men’s length. It’s adjustable and stays on your wrist with a firm buckle clasp. It is really sharp looking. 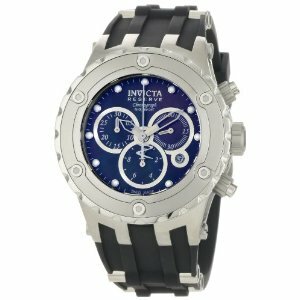 The case is only a mere 43mm across – more than 10mm smaller than some of Invicta’s Men’s line watches. The 524 uses flame fusion to protect the face, which is considered the best of the best. Two elements are fused together to give the strongest protection seen yet. It won’t break and is highly scratch resistant, so you don’t have to worry about where you wear this. And if you like the color blue, you’ll love that the dial is blue and looks stunning against the stainless steel case, silver numbers and hands. The hands and numbers are also luminous, so when you go diving, you’ll always know the time; though like other Invicta watches you may wish it was a little brighter. But, you can take this Midsize Reserve with you deep into the water, a staggering 1640 feet! The bezel is stationary, which is okay because of the classic Swiss Quartz Movement that maintains it. You can’t get more accurate with your time! Another added bonus in this watch is that it is a chronograph. Watch the time and stop the time all in the same place. This watch is definitely made to fit the average sized man, so if you are looking for a huge masterpiece there are other watches you may want to check out like the 5511, 1465 or 0517. The price, however, is quite high at $2,395. But if you are looking for a stunning watch that can go under water like no other and have extra money, The 524 Men’s Midsize Reserve Chronograph may be worth it. And remember, very few others will have this handmade, limited edition timepiece.